→ USA "Other": Bexley; Cross; Esterbrook; Carter, Chilton, Moore, Leboeuf, Dunn, Triad, etc. The pen companies that used possessives in their names continue to give me headache. If the company was "Carter's", and I want to describe something possessed by that company, does the term morph to Carter's's, as in Carter's's factory burned down? Probably not. Still, literary convention might miss the fun of hitting the double posessive. Probably though this is why many of us tend to describe the old companies sans apostrophy-"s", leaving us with a Carter fountain pen. Makes things bit easier when possessive form is required. Carter made pens only a few years (it seems) and catalogue data is limited. 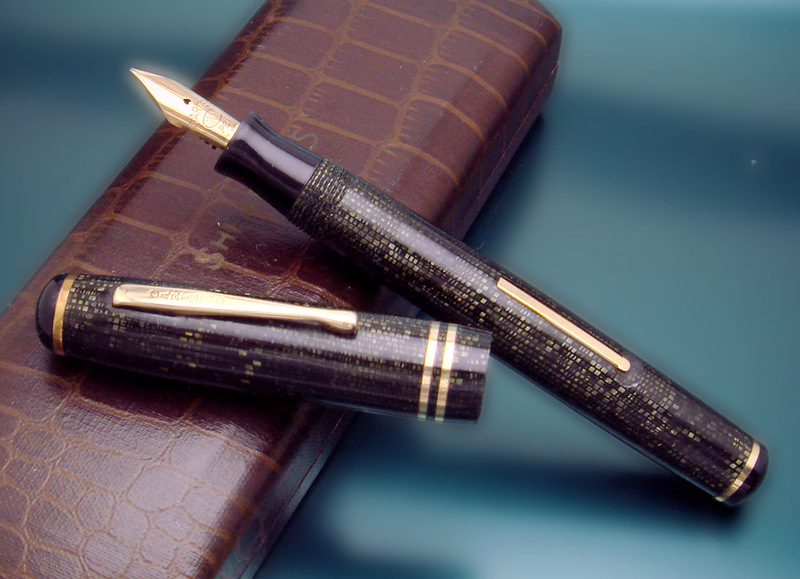 Yet the pens are high quality and are highly sought, the relatively small collector base keeping prices for the scarce pens at least on par with similar items by the Big-5. 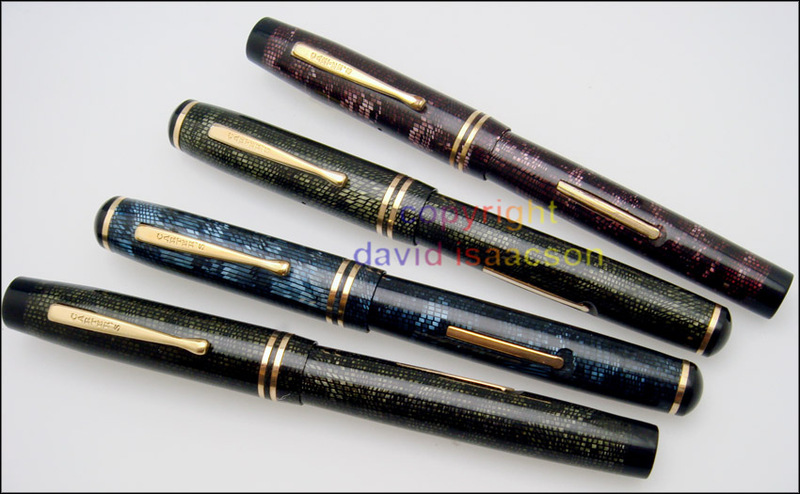 The pens described by many as "snakeskin" pattern seems to be more of a pearlescent mosaic. The geometry of the black lines is rectangular. But variation within the pearlescent plastic further enhances appearance. These are uncatalogued, at least so far. They are quite scarce and hold significant cachet to Carter collectors. At this point after about twelve years collection, I've managed to score four. I'm aware of two styles: one with rounded end pieces and tassies, the other with less rounded end pieces sans tassies. What do they look like un-capped? They are quite stunning. Obviously, they wanted to stand out from the rest of the pack with those celluloids, and it looks like the fit and finish speaks to a quality pen. I would like to know more about Carter's and Carter's' (?) pens. 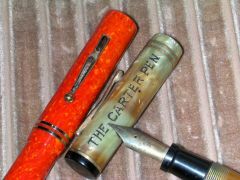 I know of them mainly as an ink company and never gave much thought to their fountain pens. Edited by jonro, 12 December 2014 - 03:38 PM. You'll grab one at some point. It took me ten years of bidding to get one at the right price, but hey that's part of the fun no? Back to USA "Other": Bexley; Cross; Esterbrook; Carter, Chilton, Moore, Leboeuf, Dunn, Triad, etc.